Sculptor Douglas Jennings' statue of Margaret Thatcher. Image: Douglas Jennings/PA Wire. A planning committee unanimously voted in favour of the £30,000 statue which was originally intended for Parliament Square in Westminster. The statue is set to stand on a 10ft-high granite plinth due to fears of a "motivated far-left movement... who may be committed to public activism". It will be located at St Peter's Hill in Baroness Thatcher's home town of Grantham, Lincolnshire, a place those in favour of the application said she had put into the "worldwide consciousness". Lincolnshire Police said they did not oppose the application but urged the committee to be cautious around the security of the statue. Fears about the statue being vandalised were at the forefront of some of the councillors' minds, with one suggesting the statue would be better place "in the middle of a pond" to stop people climbing it. 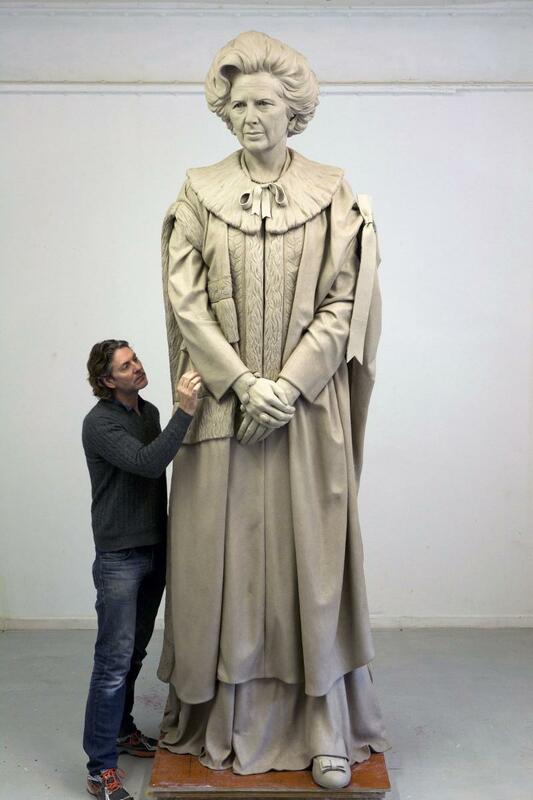 Sculptor Douglas Jennings working on his statue of Margaret Thatcher. Image: Douglas Jennings/PA Wire. South Kesteven District Council chose to dismiss objections from the public, which included the potential for crime and disorder, Mrs Thatcher's divisive policies, and public cost implications. Currently, the only marking of Baroness Thatcher in the town is a plaque on the corner of North Parade and Broad Street to show where she was born. The statue, standing just over 20ft high, will be situated in between the two existing statues in the area of scientist Sir Isaac Newton and 19th century politician Frederick Tollemache. Designed by sculptor Douglas Jennings, the statue was rejected by Westminster Council last year with a report saying it could have attracted "potential vandalism and civil disorder". But the Lincolnshire-based council decided to grant permission on the condition it is erected in the next three years. A small number of Labour Party members from the area protested outside the Guildhall before the hearing, displaying banners such as Grantham Resident Against Maggie. The idea had 17 objections and seven people writing in support, with those in favour commenting on the prospect of an "enhancement to Grantham's tourist offer". Throughout the meeting, the committee's chairman Councillor Martin Wilkins attempted to remind the panel they were a non-political body, to which one councillor replied: "This is a statue of Margaret Thatcher, how can it not be political?" A report to the committee said: "In general there remains a motivated far-left movement across the UK (though not so much in Lincolnshire) who may be committed to public activism. "Margaret Thatcher does however maintain an element of emblematic significance to many on the left and the passage of time does seem to have diminished that intensity of feeling." Councillor Charmaine Morgan said she would not vote on the application and spoke against it, saying: "It is currently being held in an out of sight, secret location. "Perhaps it should stay there." But those in favour questioned why it had taken so long for the statue to be brought to the town. "Very few towns can claim a prime minister," one supporter said, adding: "Grantham should be proud."